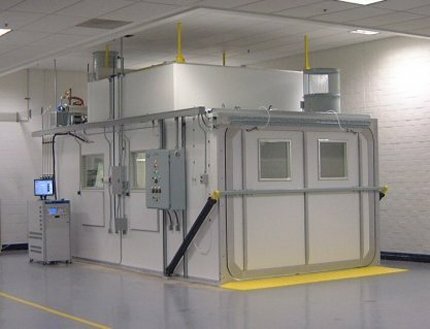 Why choose a Webber EMI Evaporative Emissions Testing System? 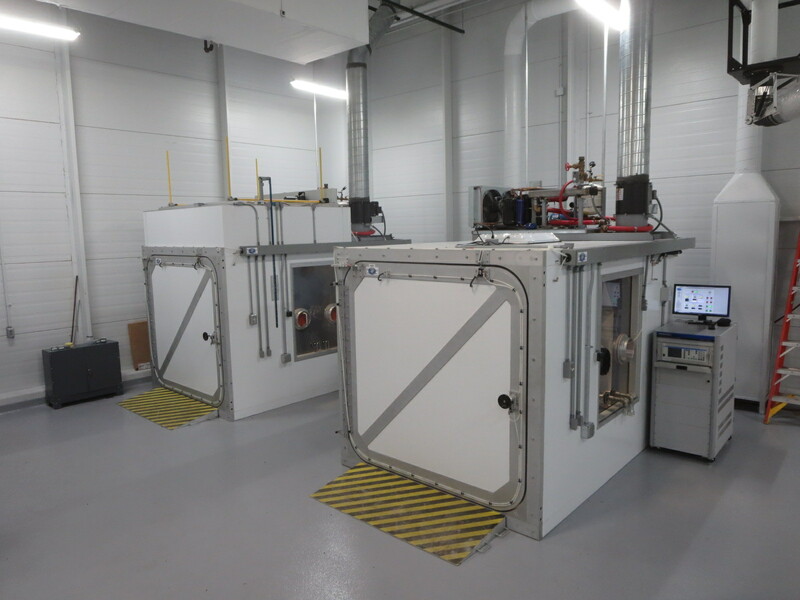 Each Webber EMI Evaporative Emissions Testing Systems uses our exclusive ‘Ure-lok’ interlocking panel design, which serves to double the sealing surface between each panel. Panels are held together by a patented mechanical interlocking system to further increase sidewall rigidity and live load ratings. Each panel employs a chemically bonded cross-section with an exterior surface of aluminum, an interior surface of type-304 stainless steel, and a 4” thick fire retardant urethane foam core. The panels contain no organic materials (i.e., wood or other cellulose-based materials), which can warp or naturally deform. All panel-mounted windows use triple-pane safety glass and are fully sealed and trimmed inside and out. This ensures that all Webber EMI SHEDs have a durable and attractive exterior and an easy to clean interior surface that is impermeable and non-reactive to both hydrocarbons and test fuels. Webber EMI SHEDs can be fitted with either a top-hinged, tilt-up or vertical-sliding, ‘guillotine’ style vehicle door. Vehicle SHEDs can also include a separate, side-opening personnel door. All door styles feature pneumatic seals and triple-pane safety glass windows. Every Webber EMI SHED systems structure fully complies with the leakage limits and HC retention requirements stated in CFR 40 86.117-96. Additionally, the SHED structure is designed to safely withstand an internal-to-external pressure differential of +/- 2 “H20 (+/- 0.5 kPa) without deformation or other negative effect. In addition to our exclusive Movable-Roof volume compensation system, Webber EMI is the only manufacturer to offer a Mass-Flow Balance (MFB) orifice system, and a conventional ‘bag-based’ volume compensation system. These systems are all designed to maintain a zero pressure differential relative to outside ambient conditions across the SHED’s entire temperature range. While all three systems provide excellent accuracy and repeatability, the Webber EMI Movable-Roof system has been designed to eliminate the need for Tedlar bags or other artificial devices to facilitate SHED expansion. By eliminating the ‘dead space’ typically required in a ‘bag-based’ SHED, the working volume of a Movable-Roof SHED is reduced, thereby resulting in improved testing accuracy – an absolute must for the new ‘zero evap’ regulations. 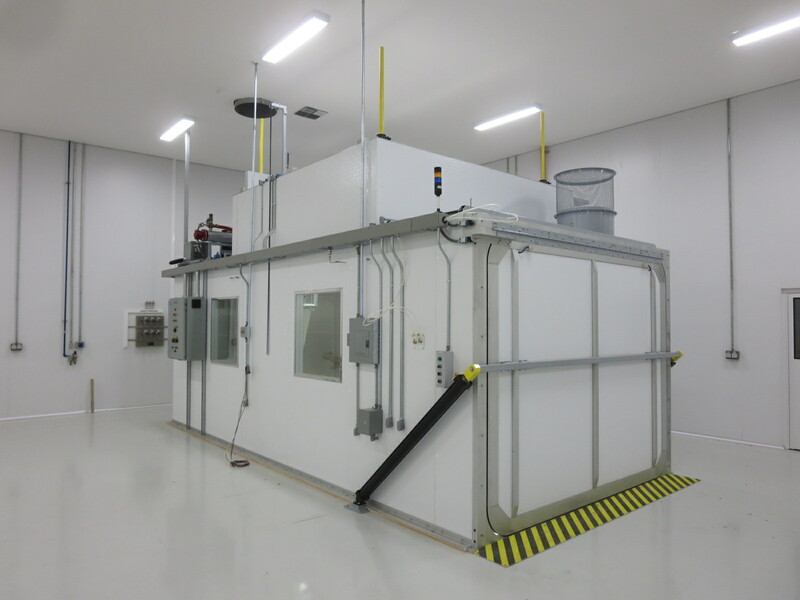 Additionally, the Movable-Roof system provides precise feedback of SHED volume at ALL times during the test procedure, thus allowing for real-time reporting of HC mass values. Webber EMI SHED systems use dedicated, self-contained HVAC systems as standard equipment. Each system is sized according to the SHED systems enclosure and the customer’s temperature requirements. 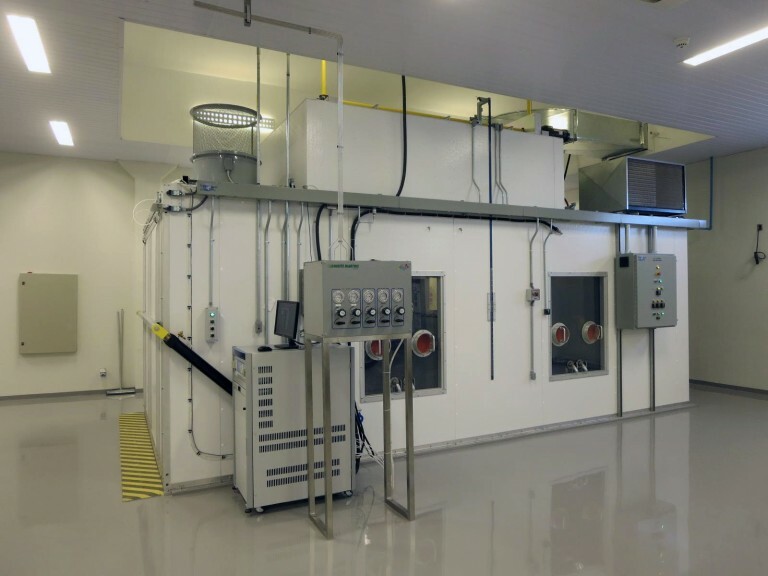 In the case of VV/VT SHED systems, the HVAC systems are capable of moving the SHED air temperature between 65 and 105 °F in approximately 1 hour. Custom systems are available to produce and maintain SHED air temperatures below 40 and above 140 °F. In all cases, Webber EMI SHEDs are capable of maintaining temperatures required for diurnal emission and hot soak testing as described in CFR 40-86.117.96 and CFR 40 part 86 subpart B, respectively. All Webber EMI SHED systems utilize a Windows-based, proprietary SHED data acquisition and control system. This system is versatile, powerful and very user-friendly. It contains a menu of all pertinent U.S. EPA and California ARB SHED test procedures, ready for immediate use. It also provides the ability to easily develop and save custom test procedures for internal product development. This control system is capable of being used with a variety of HC analyzers. In addition to the PC-based controller, Webber EMI SHED systems include a local control panel, which allows for full manual operation of the SHED and various sub-systems. All Webber EMI SHED systems are supplied with a number of safety systems such as a Low Explosion Limit (LEL) detection system and pressure / temperature limiting switches. Optional safety equipment includes fire suppression systems, retractable vehicle grounding straps, rotating light beacons, and audible alarms. All safety systems are interlocked with both the manual and computer control systems to ensure safe operation.